The family’s story sparked a debate on the controversial ‘Catholics first’ policy in many primary schools. 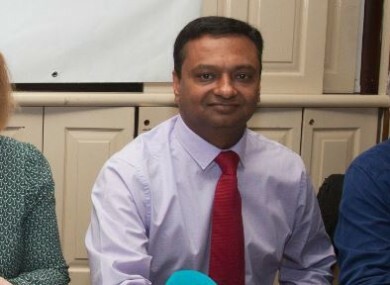 ROOPESH PANICKER AND his wife Najamol Kalangara considered leaving Ireland because they couldn’t get a place for their daughter Eva (6) in a local Catholic school. Originally from India, both Roopesh and Najamol have been in Ireland for 9 years and lived in Killkenny and Limerick before setting up home in Dublin. They are now Irish citizens. Two years ago, the couple applied to seven Catholic schools and were put on a waiting list for each one due to the fact that Eva is not Catholic. The family’s story a sparked nationwide debate on the controversial ‘Catholics first’ policy in many primary schools when the couple first spoke out on the issue two years ago. Supporters gathered and marched to Government Buildings in solidarity with them in a protest held in November 2015. “When I started inquiring in the nearby school about what will happen to her if she doesn’t get a place, they said they would keep her on the list for the next year. Next year, what would happen is she would have gone back on the same list. There’s no chance,” Roopesh told TheJournal.ie. Roopesh is supporting the Solidarity-PBP Equal Participation in Schools Bill, which is due to be debated in the Dáil this evening. The bill would abolish the so-called ‘baptism barrier’. Under current laws, schools may discriminate on the basis of religion when it comes to admissions in situations where they are oversubscribed. The couple wanted a place for Eva in a particular school that was just five minutes away from their home and just across the road from her playschool. Roopesh explained that each of her friends from the playschool got a place in the school. Eva wasn’t offered one. Roopesh contacted the school’s board of management to be told that they had the right to discriminate and they accept Catholic children first because they are a Catholic ethos school. “They accept the Catholics first, then the catchment area, then the past pupils’ children, then they have teachers’ children and then comes the non-Catholics in the catchment area,” he said. By the time you’ve gone through the list you won’t get a place. The couple finally got Eva, who is being raised in the Hindu religion, into a Catholic school seven kilometres away from their home. Roopesh told TheJournal.ie that he has to travel to his friends’ houses in Kilkenny at the weekends for Eva to have playdates because she doesn’t have any friends near where they live due to her school’s location. I have to take her to our friends’ houses which are far away because she doesn’t have any friends. All the children that live in our building got into the schools she didn’t get into. Roopesh also said that being enrolled in a Catholic school is beginning to confuse Eva. “This morning, she asked me when she was going to make her communion. She’s being influenced and she’s picking it up from the school because obviously I’m not teaching her these things,” he said. Speaking at a press conference yesterday, Solidarity TD Ruth Coppinger claimed that while census figures show an increasingly diverse society “moving in a progressive and tolerant direction”, the Dáil is moving backwards. “Parents want an end to their children being barred from local schools on religious grounds. Young people want an objective curriculum that doesn’t censor and acknowledges sexuality in all its forms,” Coppinger said. Not only must the ‘baptism barrier’ be outlawed, but once in school, students must not be exposed to indoctrination and the curriculum must be freed from religious interference. In an Ipsos MRBI poll for The Irish Times in 2015, the majority of respondents agreed that children should have equal access to school places whether or not they had been baptised. Minister for Education Richard Bruton yesterday announced that he will hold a Forum on the role of Religion in Primary School Admissions on 29 May, as part of the current consultation process being carried out on the issue of removing ‘baptism barriers’. In January, Minister Bruton announced plans to remove the baptism barrier from schools to ensure non-religious children are not discriminated against in school admission policies. “While only 4% of our primary schools are under non-religious patronage, 10% of the population in the recent census stated that they are non-religious, with this figure even higher for those among usual parenting ages,” he said. In January, the Catholic Schools Partnership claimed that, for most of its schools, students are not selected based on religion. “The fact is that being baptised is not a criterion for entry into a Catholic primary school which is not oversubscribed. Anecdotal evidence suggests that the number of Catholic primary schools that are oversubscribed is low, estimated to be between 4% and 5%,” the partnership said. Email “'All the children that live in our building got places in local schools - our daughter didn't' ”. Feedback on “'All the children that live in our building got places in local schools - our daughter didn't' ”.